Complimentary air-conditioned coach transfers from the airport. One half day family excursion of North Goa by A/C Coach or Car. An adventure activity-choose between Rock climbing, Rappelling or Jummarring per person once during the stay. Trek around the Portuguese fortress. A host of kid’s activities under the supervision of an experience team. 10% discount on laundry and telecom. An Additional person 12 years and above sharing the same room will be charged INR 10500.00 for a 3 nights stay inclusive of Extra roll-away bed, buffet breakfast, Meal Credit of INR 5250 for 03 nights, excursion and taxes. Children between 5 to below 12 years will be charged INR 6000.00 for a 3 nights stay inclusive of buffet breakfast, excursion and taxes. 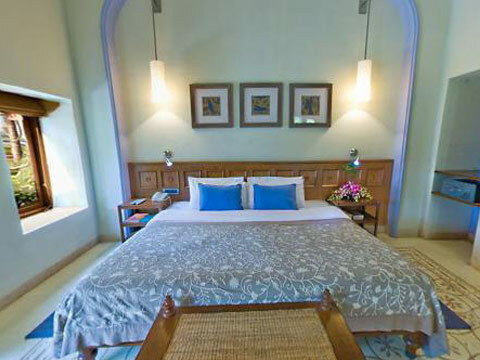 Superior Charm Cottages w/ Balcony are located on the first floor of a cottage structure with a balcony and garden view. 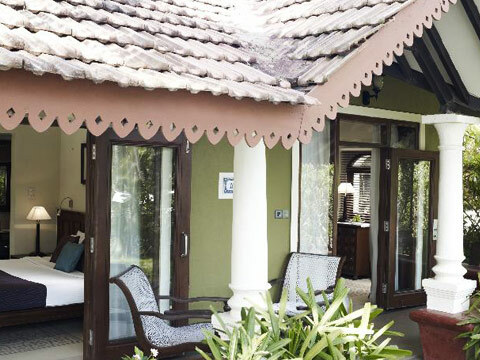 All Vivanta by Taj - Holiday Village retreats are a striking amalgamation of modern elegance and Goan/Portuguese architecture. Original hanging lamps by local Goan artist Radhika Mallick add to the ambience. Superior Charm Cottages w/ Balcony have been recently renovated and have a view of the tropical landscaping architected by designer Made Vijaya. All rooms in this category have a Treat Yourself mini bar, DVD player, LCD television, 2 line phones and newly designed bathrooms with a bathtub. Find your room by looking for the numbers on Azulejos, the famous blue and white tiles, an art tradition inherited from the Portuguese. Superior Charm Cottages w/ Sit Out are garden facing, ground level rooms with lush lawn sit outs. 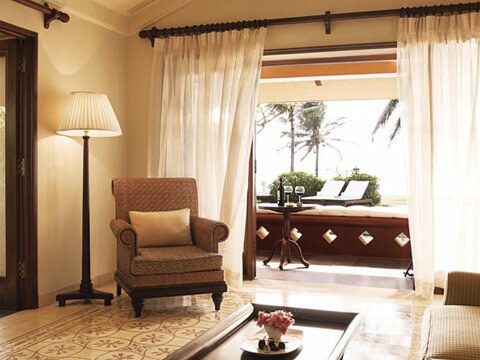 All Vivanta by Taj - Holiday Village retreats are a striking amalgamation of modern elegance and Goan/Portuguese architecture. Original hanging lamps by local Goan artist Radhika Mallick add to the ambience. Superior Charm Cottages w/ Sit Out have been recently renovated and have a view of the tropical landscaping architected by designer Made Vijaya. All rooms in this category have a Treat Yourself mini bar, DVD player, LCD television, 2 line phones and newly designed bathrooms with a bathtub. Find your room by looking for the numbers on Azulejos, the famous blue and white tiles, an art tradition inherited from the Portuguese. 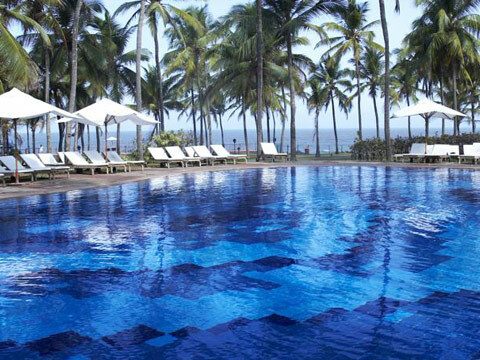 vivanta by Taj - Holiday Village, Goa, is different, yet the same in many ways. Still the charming village, that flirts with the seafront. Where fun lovers come for repeat doses of delight. There's a nice new buzz however. In the renewed cottages and villas, the nouvelle restaurants, the island bar, and the spa where you'll go Ah! 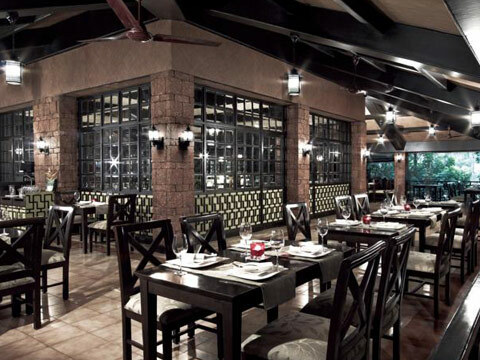 Chef Rego remains, as always, eager to wow you with specially designed meals. Try mixing biz with fun and see how well wired the village is.